Enjoy the hours of play with Chuck the chameleon through 9 funny worlds and help him to find his way by exploring 58 crazy levels. Don’t forget to defeat the final boss! 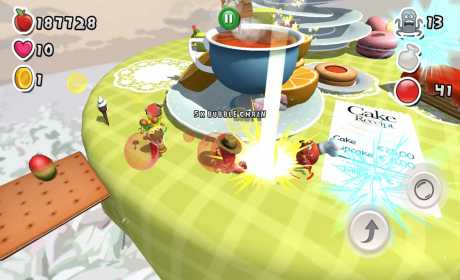 Use bubbles to trap the enemies and try to eat as many fruits as you can to reach the top of the world hall of fame. The Free version comes with in-game Video Advertising but you can play and finish the story without paying the app (no in app purchase). The Pro version has the same gameplay but without Video Adverts (no in app purchase as well) and comes with some additional features: Multiplayer co-op online up to 4 players, synchronization of saved game progress (slot) between all devices and funny character customization. Free version requires internet connection to play. 9 different theme worlds for a total of 58 levels, animated monsters, traps, moving platforms, animated monster obstacles, pitfalls and final boss fighting. 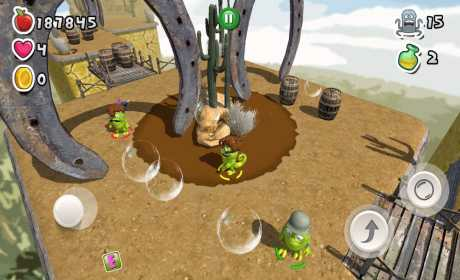 Enjoy Bubble Jungle with your friends up to 4 players simultaneously through Internet. Play the story online by entering into available rooms or make your own game room from the level you like and invite your friends with in-room share button. Chuck is unique as you are, choose your look from many accessories like hats, rings, glasses, hair styles, headphones and many other cute items. Give your personal touch to Chuck the chameleon. Collect coins, candies, lollipops to power up your character and trap all enemies quicker. Try to make bubble chains to get more fruits and items. Stay away from bad items! Some of them can drive you crazy through the game for a limited time so beware of them! Play Bubble Jungle for a one minute or an hour, you can save your game progress by walking over a check point platform or by quitting the game at any time you want and saving your progress until the last checkpoint. You can save a copy of your progress up to three slots (one autosave slot + 2 manual save slots). Bubble Jungle gameplay hasn’t got time limit, so you can relax yourself playing it whenever you want. 9 worlds for the total of 58 levels of funny gameplay: Caribbean Island, Bake the Cake, Japan Mystery, Wild West, 8bit, High Mines, Crazy Toys, Magical Fantasy and Deep Space. Don’t miss the final boss fighting! Start playing Bubble Jungle on one device (for example phone) and move your progress to another device (for example tablet). Create your free Bubble Jungle account in order to access a free Bubble Jungle cloud storage where you can save the game progress and transfer it through your devices. *Time calculated approximately exploring each level entirely. 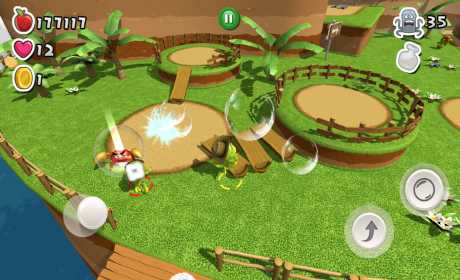 Bubble Jungle® is a European trademark of Cranky Monkey Studio s.r.l. All rights reserved.